How was your Beach Streets? 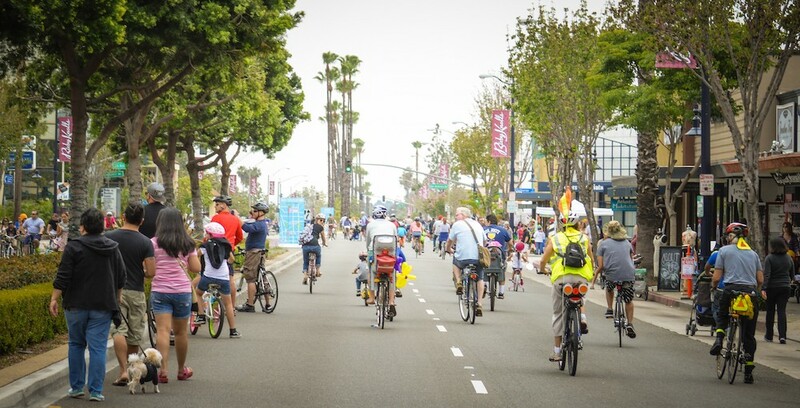 Long Beach, the aspirational most bike-friendly city in America and demonstrably the most bike-friendly city in L.A. County, has joined the ranks of cities hosting open streets festivals or ciclovías. Long Beach’s first ever Beach Streets was full of camaraderie, chillness, and community. For a photo essay, see our sister site LongBeachIze. Lots more photos at The Source. For a look at the Long Beach bike-share system demo, see SerenaGrace Tumblr. How was it for you, SBLA readers? Are open streets festivals different in cities that embrace two-wheeled transportation? 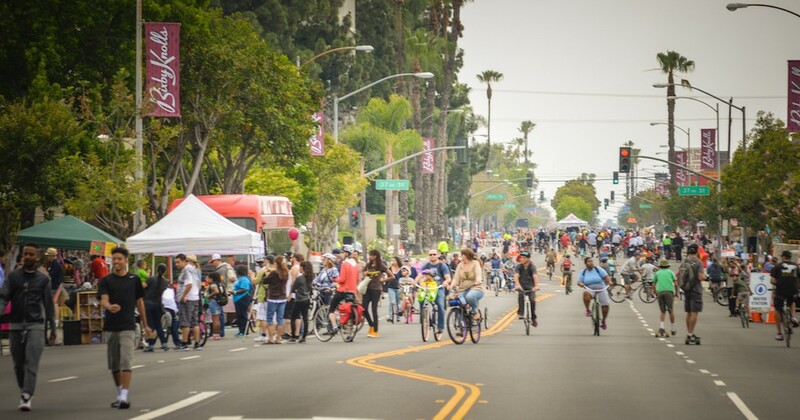 Was Long Beach’s ciclovía markedly different than open streets festivals produced by the non-profit CicLAvia? Has Metro’s countywide open streets initiative spread these events to new places and exposed new people to the awesomenesses that are ciclovías? Comment below! There was definitely a more chill feeling to Beach Streets in general. Maybe this was because the event was, as far as any of us could tell, more localized than any CicLAvia event. For example, the skate park in Houghton Park was full of kids who usually skate there plus other folks. There was a lot more music, for sure. There were live bands seemingly every quarter mile (the 13 year-olds playing Nirvana killed it)–that’s not even mentioning The Pharcyde. It was odd to say the least that for a Metro sponsored event, Metro decided to choose the weekend of Beach Streets to shut down the Blue Line from 23rd to Vernon—um, arf? It was fine, we just biked down Adams and its nice bike lanes, but man, that’s the antithesis of synergy, right? It also didn’t help that the sheriffs were checking cards for people exiting the Vernon station, creating a scrum which they had to intention of clearing a path for people trying to get on the Blue Line. So Metro dropped the ball there. Lastly, from what we heard, there were demonstration bike lanes on Wardlow from the Blue Line–but those had disappeared by 1. Again, no big deal, Pacific to 36th was way better anyways, but a deviation from the plan. All in all, it was awesome. An open streets event that definitely had its own feel, and a very Long Beach one–which is cool, not everything needs to be branded CicLAvia. Plus, petting zoos. The Militant Angeleno was there! Agreed. Epic FAIL for Metro. They had such great service on the Gold Line for last weekend’s CicLAvia, but the Blue Line bus bridge fiasco was inexcusable. Even those who wanted to use the so-called “Silver Line” bus instead were at a disadvantage, since the racks can only carry two bikes per bus. For sure, for anybody that brought their bike but didn’t know how to “bike-bridge” on their own from 23rd to Vernon, they were SOL. I just hope the lady to CatCon made it okay, she was cool. Also whack, the ticket trap in the first place–Metro could’ve just had people tap on the bus bridges. This was a great event, which I hope to see more of. I especially liked how it linked two neighborhoods that are economically and racially diverse from each other. Plus, all the regular ciclovía awesomeness. On the making things better side, I thought it was a mistake to not have the route touch a Metro rail stop. I like to walk the ciclovías, and as a pedestrian, the walk from Wardlow Station to the start of the route at Atlantic left a lot to be desired. At the other end of the route, the bus shuttle service wasn’t as convenient as it should have been to Houghton Park, and I didn’t see any signage about it, except on the website. I was surprised to learn that they weren’t planning this event for Downtown LB, which has better transit access and tons of shiny new bike infrastructure to show off. Long Beach funded this event through a competitive Metro grant. The City likely sought to direct resources through this grant to a community that is not as prosperous. There is more to ‘show off’ in terms of bike infrastructure and transit access, but as others said this was more ‘localized’. Maybe the goal was to give an opportunity for people in the hosting neighborhood to enjoy open streets. I don’t know enough about North Long Beach to say much more. It looks others still managed to make their way to the area despite the obstacles posed by things like bus bridges, which must’ve been frustrating. I attended the CicLAvias in Chinatown and Leimert Park but cannot make a fair comparison to Beach Streets because I didn’t venture far. Beach Streets was a blast! As a local of Long Beach I was thrilled with Beachstreets once I got to the event. I was very surprised there was no signage for the event at the Wardlow station (I was coming from downtown Long Beach North). I particularly enjoyed the slower pace of the event so that parents walking a small child riding a bike or scooter were perfectly safe right in the middle of the lane. I only saw one teenager on a fixie going the speeds of many at a CicLAvia. The music was great. The parks were lively and it was fun to see the kids at the skate park. The businesses were very engaged. The council districts were very engaged. It was a very fun, very diverse crowd and the people watching was marvelous. While downtown LB has more transit options I think it was a great choice of location for the first LB open streets events. It really is time North Long Beach got more love, and that part of the city stepped up well and showed us all a great time. But as someone who is dedicated to growing positive inspirational stories about mindful mobility in the press I was bummed at Long Beach’s lack of outreach to anything other than the local press to share the event. A week earlier Pasadena’s CicLAvia was everywhere – tv, radio, and in all of the major papers. The CicLAvia team really have their media groove on and I am thrilled about that. However, now that I read about Metro’s train challenges the day of Beachstreets maybe it all turned out for the best? What a great idea! The idea of ciclovia is credited to my hometown of Bogota. Started in 1974, los Colombianos ride their bikes every Sunday down the major avenues of the captial city. I loved to see this happen again in the LBC!